When his family goes out of town, Evan Webber (KEANU REEVES) is left home to catch up on work in what he thought would be a quiet time. But things would soon go out of control when a… knock… comes at the door where two attractive women, Genesis (LORENZA IZZO) and Bel (ANA DE ARMAS), supposedly lost and stranded outside during a rainstorm, ask to come in to dry off their clothes and call for a car. His kind gesture soon turns into a dangerous seduction and a deadly game of cat and mouse. They turn from helpless damsels into psychopathic sadists inflicting all sorts of torture on Evan. Eli Roth, master of schlock, has a checker resume with highlights like Cabin Fever but then has been a part of some real crap either as director (Hostel 1 & 2) or producer (The Man with the Iron Fists, The Last Exorcism Part II and Aftershock, not to mention a couple Cabin Fever DTV flicks). Knock Knock is his latest, a throwback to 1970s thriller based in part on a little known film entitled Death Game. With actress and producer Colleen Camp, this horror/thriller, with a zany touch to it, might’ve been an interesting idea but instead is just the latest in the long line of failed ideas from Roth hampered even further by some utterly wooden acting by Keanu Reeves, an actor I thought I was making a turn for the better following the fantastic John Wick. Instead, Reeves provides a one-note performance while Lorenza Izzo and Ana De Armas, as deadly beautiful as they are, don’t exactly deliver quality work here. 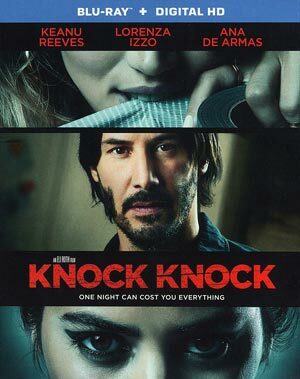 Knock Knock is the type of movie that’ll make a quick descent into the bargain bin and rightfully so. Again, it was an interesting concept, bad execution which might sum up Roth’s relatively early career behind the camera. Audio Commentary features Co-Writer/Producer/Director Eli Roth, Co-Writer/Producer Nicolas Lopez and Actress/Producer Colleen Camp. Deleted Scenes (4:51; HD) – There are two scenes included, one being an alternate ending, with an optional commentary with Roth. The Art of Destruction: The Making of Knock Knock (14:42; HD) is a typical behind-the-scenes featurette including interviews with members of the cast and crew. Also included is a Still Gallery. Lionsgate opens the door on Knock Knock presented with a 1080p high-definition transfer and in its original 2.40 widescreen aspect ratio. The transfer is mixed with good and vibrant colors and detail in some scenes weren’t bad but it was a tad over-sharpened in others, though I don’t think it was the fault of the transfer, just how it was shot. There was also some banding that permeated in some scenes. Still, it’s a fine transfer that is passable enough just nothing amazing. The movie comes with a robust DTS-HD Master Audio 5.1 track which makes use of every yell, scream, violent and sexual act, all coming from each channel. Early on there is a variety of music that reverberates through each channel giving off nice depth. All in all, this is a fairly dynamic lossless track. Overall, Knock Knock is the latest Eli Roth misfire and although on paper it sounded good, the execution was anything but. 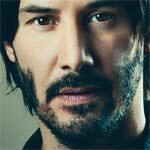 The acting was bad, including Keanu Reeves and his wooden performance, to go along with poor writing. Not sure in what circumstance I would ever revisit this film. The Blu-ray released by Lionsgate has good video, great audio and only so-so amount of bonus features.